Invented by Anna, the 7th Duchess of Bedford to plug the hunger gap between lunch and dinner. Afternoon Tea is an English tradition. 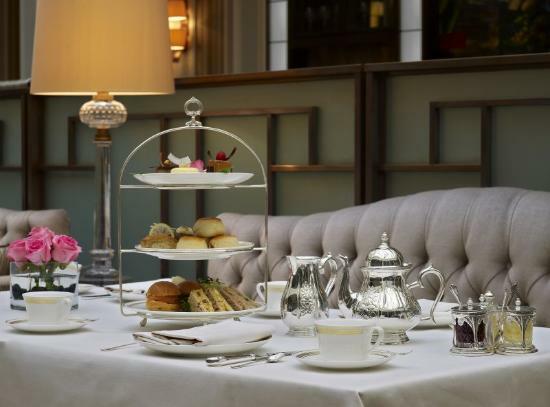 During our recent London trip Michael and I had afternoon Tea in the Washington Mayfair hotel, The tea was relatively inexpensive at £18. The traditional meal of fresh dainty egg, cress and smoked salmon sandwiches, scones jam and cream plus a selection of cakes and of course pots of tea, was delicious but we were the only people in the hotel lounge and the atmosphere was lacking. A couple of years ago I was lucky enough to have afternoon tea with some international friends from ourparisforum at the Lanesbourgh hotel in London. The setting was beautiful, the service impeccable and the food absolutly wonderful. The cost £35. 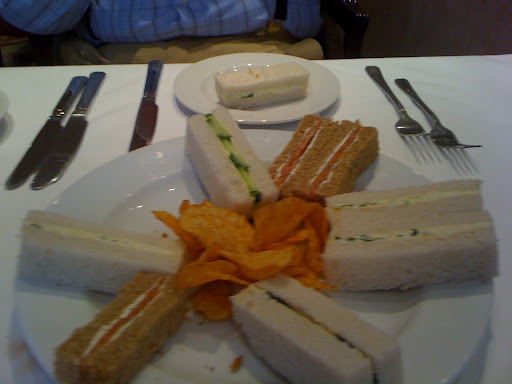 I have had a disappointing Afternoon tea at Harvey Nichols in Manchester, in a stunning situation, overlooking Millenium square but the finger sandwiches were slightly stale and the cake selection was not exciting. . This is currently advertised at £14 95p. 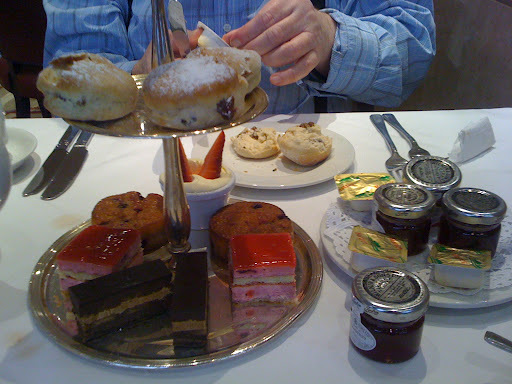 The Town hall in Manchester also does a good afternoon tea for £9. as Does the Midland and Raddisson hotels, which are much cheaper than their London counterparts. 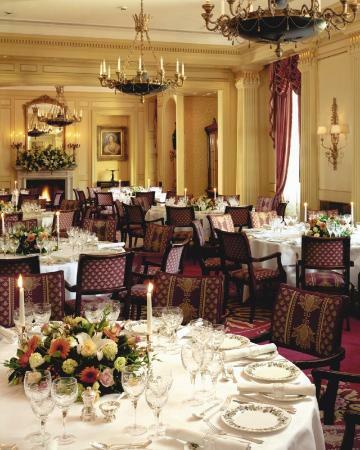 But nothing compares so far to the Lanesborough. My daughter bought me a voucher for Christmas at Slatterys, a famous local patisserie, so my research will continue soon, as a reward when I have lost 1 stone in weight, as I am currently dieting. Of course, English people do not spend their days eating full English breakfasts and stopping for sandwiches and cakes every afternoon at four. We would all be as fat as houses!. These things are nice as a treat occasionally. This got me thinking about the word “tea” as used to describe a meal rather than the drink. Being a Northern girl, from the Industrial part of England. We have words for meals that are very confusing to Southerners and my foreign friends. “Tea” in the North refers to the evening meal, traditionally eaten by working men and their families on their arrival home from work at 5-7pm from the mill, pit or factory nearby. Unlike their middle class cousins they could not wait until later in the evening to eat , first, because they were hungry and second, because they had to go to bed early to get up for the early morning shift. “Dinner” refers to any substantial meal eaten in the middle of the day. ( but is often used to describe any midday meal) Usually on a Sunday. Traditional Sunday dinner is roast beef or lamb and Yorkshire pudding,Roast potatoes vegetables and gravy. Followed by a pudding of some sort…..then a sleep in the afternoon!!!! “Lunch” refers to a light portable snack taken to work or school to be eaten in the middle of the day. “Supper” refers to a very light snack eaten before bedtime. “High tea” is a middle class/ aristocratic term, used to describe a meal, eaten around 5-6pm usually by children in the nursery. So now I am off to have some supper! Denise, we will have to treat ourselves to the Richmond Tea Room once you are eating cakes again!Your explanation of meal vocabulary is spot on, can't be doing with the main evening meal being described as "supper"! Janet…we certainly will have to try the Richmond Tea rooms in Manchester. It gets the best reviews. We could treat ourselves over Easter. How does 11th April sound? Anne… The Lanesborough has spoiled me for any other Afternoon tea! I am hoping The Richmond Tea rooms lives up to it's reputation. This is all very interesting. The terminology above explained is most helpful. So you usually have breakfast, then….lunch then tea? I know my husband uses the term "supper" when I think he should mean "dinner". Here (the States) (or how I was raised) we have breakfast and then lunch is our mid meal (lighter generally)(may or may not be portable but generally had at around noon) and then dinner (more substantial) is after work (around 6 p.m. to 7 p.m. usually)…and that is that! (unless one snacks) I am still unclear what my husband means when he refers to supper (he was raised in the country…so they did term things differently). Interesting that your lunches are generally regarded as portable (I can understand that though)…and then tea appears to be what I call "dinner"! Thank you for the explanation! Sorry Gitte, only just found this reply. Yes I have lots of lovely memories with my “internet” friends. Not just London, but Compiene (sp) the sing along in Belleville, our soiree last month and lots more. Long may our long distance friendships continue!